The purpose of this assessment is to provide an overview of the international activities of the MS-13 criminal organization. The report is the result of the analysis of arrest records, law enforcement reports, deportation records, interviews, and observations conducted by members of the MS-13 National Gang Task Force (NGTF) regarding documented MS-13 members in the United States; Chiapas, Mexico; El Salvador; and Honduras. Violent MS-13 members have crossed international boundaries and key members have documented links between the United States and the countries addressed in this assessment. Infiltration of any law enforcement agency by a gang member can have severe ramifications for the agency involved, its employees, the public it serves, and its allied agencies. Gangs employ various tactics to include infiltrating an agency directly or indirectly, to achieve their objective; to counter this threat, law enforcement must remain cognizant of and employ mitigation strategies. Gangs’ motivations for infiltrating agencies vary; thus law enforcement must remain cognizant of suspicious employee behavior, identify possible motivations for infiltration, and employ mitigation strategies to counter infiltration threats. The Barrio Azteca was organized in the El Paso, Texas, County Jail in 1987 from where it moved to the streets and the Texas Department of Criminal Justice prison system. The Barrio Azteca prison gang – which has chapters in El Paso, Texas, and Juarez, Chihuahua, Mexico – has historically been linked to the Juarez Cartel. Barrio Azteca membership is estimated at 3,500 inside and outside of the prison system. Members have been reported in Texas, New Mexico, Colorado, Nevada, Arizona, California, Oklahoma, Idaho, Washington, Kansas, Illinois, South Carolina, North Carolina, New Jersey, New York and Utah. They participate in enforcing the rules of the Juarez Cartel in El Paso, Texas, and southern New Mexico. This book is a compilation of various gang intelligence information from various sources including detective and police officer files, primarily confiscated from arrested and/or incarcerated individual gang notes and drawings. Additional material was obtained from other law enforcement agencies’ publications and presentations used for internal officer training, as well as from various other gang publications and internet sources. Six major New York City gangs are presented in this book: the Bloods, the Almighty Latin King and Queen Nation, the Netas, the Crips, Mara Salvatrucha (MS-13), and the Mexican Gangs. Sections within this book include the origin and history of the gang, its structure, rules and regulations, oaths and pledges, symbols and emblems, coded language and hand signals, clothing, tattoos and graffiti. It is our hope that an officer’s knowledge of gang characteristics will assist in combating gang-motivated crimes and reduce the propensity for violence towards the law enforcement community and innocent citizens. 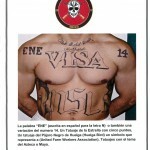 Gulf Coast High Impact Drug Trafficking Area Law Enforcement Sensitive Guide to Identifying Mexican Gang Tattoos.